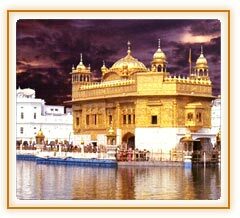 The word Amritsar means the holy pool of nectar. 1573 Work began on digging the holy pool. 1601 Harmandir Sahib completed. 1604 Guru Granth Sahib installed. Alongside people representing 52 professions settled. In Maharaja Ranjit Singh's time Amritsar had superceded Lahore as the pre-eminent city of the Orient. 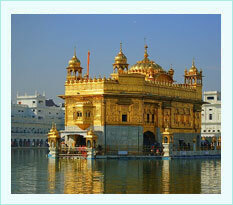 Amritsar is one of the most ancient and fascinating cities of India. 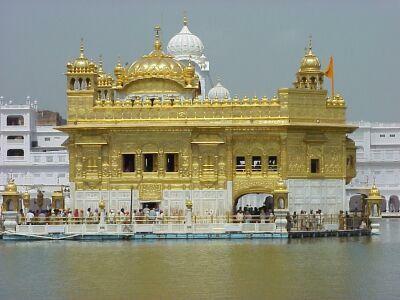 It is an important seat of Sikh history and culture. Being the gateway for travellers coming to India on the overland route from central Asia it soon became the centre of various commercial activities. 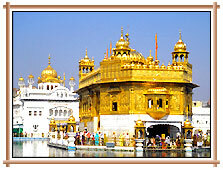 Amritsar has various historical and religious sites. The most famous of them all in the Golden Temple which was founded by the fourth Guru of Sikhs, Guru Ramdas and completed by his successor Guru Arjan Dev. Another revered shrine is the Durgiana Temple which is dedicated to goddess Durga. 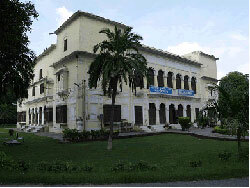 The museum at Ram Bagh houses weapons dating back to Moghul times and some portraits of the ruling houses of the Punjab. 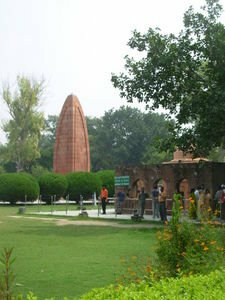 The Jallianwala Bagh at Amritsar reminds the visitor of one of the most heart-rending events in the history of India. Bullet marks and the well into which some people jumped to escape the onslaught can still be seen. Some other attractions are—the Fort Gobind Garh which was built by Maharaja Ranjit Singh and the Tarn Taran tank which is 25 kilometres south of Amritsar. 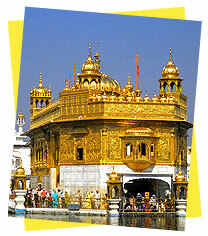 The most interesting place to stay is the Golden Temple. Accommodation at the gurudwaras—Sri Guru Ram Das Niwas and Sri Guru Nanak Niwas—is easily accessible. Other good accommodation facilities and dining options are also available. Katra Jaimal Singh, near the telephone exchange in the old city, is a good shopping area. Amritsar being an important trade centre is very well connected. There is a daily Indian Airlines flight to Delhi and Srinagar. Direct rail links to Delhi, Lucknow, Varanasi, and Calcutta are also there. There are frequent buses plying to Dehra Dun, Shimla, Kulu, Dalhousie and Dharamsala. During Maharaja Ranjit Singh's reign the lower half of the temple was decorated with marble while the entire upper half was inlaid with copper covered over by gold plate : hence its new name, the Golden Temple. Free kitchen and recitation of the divine word never cease here. Its four gates invite everyone from all directions. Sixth Guru Sri Har Gobind had got it constructed as a seal of temperal authority symbolising the unity of spiritual and temporal life in 1609. Built in the memory of Baba Atal Rai, son of Sri Har Gobind Ji, this octagonal nine-storeyed structure about 50 meters high has several beautiful frescos on its walls, relating to the life of Guru nanak Dev Ji. Martyrs' Memorial built in the shape of eternal flame of liberty is situated on the outskirts of Golden Temple. Here, about 1500 to 2000 persons who were attending a peaceful meeting during the freedom movement fell under the bullets of the British General Dyer, on April 13, 1919. The British Queen Elizabeth II and her husband laid a wreath at the Memorial on 14 Oct.' 1997. Situated outside the Lohgarh Gate it is built after the design of the Golden Temple and attracts sages and scholars in Hindu scriptures from all over India. Situated at a distance of 40 kms. from Amritsar the walls of this mosque are decorated with beautiful floral motifs. Is situated in the middle of a beautiful garden called Ram bagh in Amritsar City. This garden is laid out on the pattern of Shalimar Bagh at Lahore. Only its architecturally unique 'darshani deorhi' has remained intact. A museum after the name of the Maharaja is set up here displaying oil paintings, miniatures, coins, weapons and Mss relating to the Sikh period. Khalsa College, Amritsar was founded in 1892 and built on grand scale in typical Sikh architecture, its distinguished alumni; sportsmen, servicemen, administrators, professionals, fill up India's compilations of Who's Who. On a part of its land a new University called Guru Nanak Dev University was established at Amritsar. Soon it has become distinguished for starting modern curricula and has etched its name on the sports map of India. There are a number of cotton, woollen and art silk textile factories besides other industries dealing with electric goods, sewing machines, auto parts, carpets in Amritsar. The milk processing plant at Verka about 6 kms. from Amritsar is the second biggest project of its kind in the country. Amritsar is India's leading exporter of goods to the Middle-East, leading distribution centre of dry fruits, tea and condiments. Amritsar is a shopper's paradise and a gourmet's delight. It is world's leading centre of Punjabi publications. 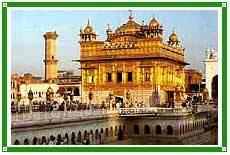 24 kilometres south of Amritsar is Tarn-Taran-a town founded by Sri Guru Arjan Dev in 1590. 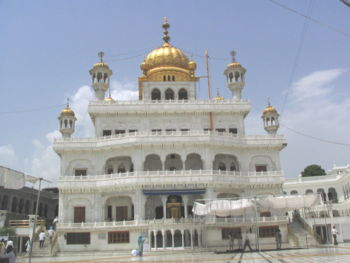 The Gurudwara got constructed by the Guru stands on the side of a large tank. Fairs are held here on every 'Amavas' dark night of the month, birth anniversaries of the Gurus, Baisakhi and Diwali. A few kilometers away from Tarn Taran is the town of Goindwal, where Guru Amar Das established a new centre for preaching Sikhism. A 'Baoli', well paved with 84 steps was constructed here. The devout believe that by reciting Japji Sahib, the divine 'Word' revealed to Guru Nanak Dev Ji at each step after taking a bath in the Baoli provides 'Moksh', liberation from 84,000 cycles of life of this world. Khadur Sahib is 32 kms. south-east of Amritsar city and close to Goindwal. During the life of the second Sikh Prophet, Guru Angad Dev, it was the centre of Sikhism. 16 Kilometres west of Amritsar on Choganwan road is Ram Tirath, commemorating Maharishi Balmik Ji's heritage. A big fair now recognised nationally and lasting for four days is held here since times immemorial on every Kartika Puran-mashi (full moon night in November). The lake formed at the point of confluence of rivers Beas and Sutlej at Harika ford, situated mid way between Amritsar and Ferozepur was declared a national wildlife sanctuary in 1982. It is a welcome winter home to about 350 odd species of birds from far flung lands of China, Siberia, Afghanistan and Pakistan. Situated about 45 kilometers east of Amritsar on the Batala road. Sri Guru Tegh Bahadurji, revealed himself to Makhan Shah Labana, a Sikh devotee here. It has a magnificent Gurudwara where people gather in thousands on every amavas (moonless night) and an annual fair is held on Raksha Bandhan day (night of full moon in August) when about one lakh people visit the place.